How To Tell If Your Shoes Are Worn Out. Shoes are the most important piece of equipment for a runner. They are the protection from concrete, they are the support for the arch and they can carry you through some great runs. They do however, tend to break down. We took a few minutes to write about how to tell if your shoes are toast. Most folks will take a look at the outsole of their shoe and assume because there is still rubber on there that they've still got plenty of wear left. However, most outsoles are made out of similar compounds to your car tires, it takes a long time to get through that (unless you scrape your foot every time you take a step like me!). The midsole is the part of the shoe to pay attention to. It is where you get most of your cushioning and support from and it happens to break down the quickest. Every time you take a step when running you're throwing two and a half times your body weight at the ground, the midsole takes a beating. If you start to feel little aches and pains that maybe weren't there when your shoes were new it may be time for a new set. If you start to notice a bunch of compression marks on the midsole and you're feeling like the shoes are a lot firmer than they used to be it may be time for a new set. 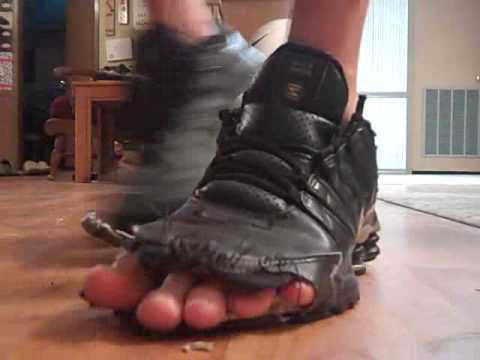 The best way to tell if your shoe is worn down is to do the old' twist test. Take the shoe and give it a twist, if it is really easy to bend through the midfoot then it may be time for a new set. 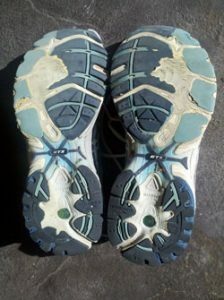 I usually tell folks to start looking at a new pair of shoes around 350 miles in order to extend the life of both pairs. If you're really not sure take them into the Rhode and we'll take a look. Whether they're all done or still have a few hundred miles on them we'll let ya know.